Why install a Hydroboost in a Fox Mustang? Two words: engine swap! A Coyote or 4.6L modular engine swapped into a Fox Mustang leaves no room for a vacuum brake booster. Most people prefer power-assisted brakes over manual brakes, making a Hydroboost conversion the best solution. Excellent brake response regardless of engine vacuum. Vacuum-assisted brakes provide varying levels of assist, depending upon the available vacuum supply. The changing assist causes inconsistent pedal feel. This is especially noticeable in a Mustang that's open-tracked, due to the wide fluctuations in vacuum from extended periods of wide-open throttle followed by hard braking zones. Not enough vacuum at idle to operate a vacuum booster. Some pushrod engine cams don't allow the engine to create enough vacuum to operate a vacuum brake booster. Low brake pedal effort, even with small-diameter brake rotors. Firewall adapter block. MM's billet aluminum design mounts the Hydroboost unit at the correct angle, the correct height, the correct fore/aft location, and the correct lateral location to operate exactly as it was designed to operate in a 1999-2004 Mustang. The 4 mounting studs are located to match the Fox firewall pattern of holes. Brake pedal. The pedal arm is made of high-strength alloy steel, with the pushrod pin in the correct location to match the brake pedal ratio and pushrod geometry of a 1999-2004 Hydroboost Mustang. This gives the brake system the correct pedal travel and effort, and keeps the master cylinder from being over-stroked. The separate pedal pad is adjustable via multiple mounting holes to accommodate different driver preferences. Pedal box spacer. A billet aluminum MM-designed spacer replaces the breakage-prone stock plastic spacer located between the firewall and the pedal box. Tools. An MM-designed special socket removes the giant nut securing the Hydroboost unit to the stock firewall mounting plate, and then reinstalls it on the MM Aluminum Firewall Block. A second MM special tool easily modifies the firewall hole for the master cylinder pushrod. Which front and rear brake setups does it work with? The Hydroboost is simply a type of power assist, just as a vacuum booster is a type of power assist. It will work with most of the front and rear caliper setups used on SN95 and Fox Mustangs. 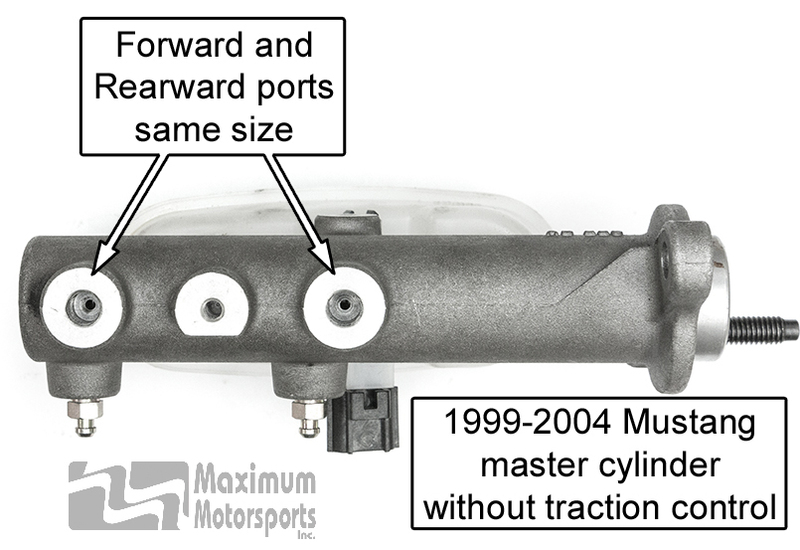 A limitation is the lack of master cylinder sizes available for the Hydroboost. This makes it important to confirm that the volume of fluid required to move the caliper pistons is compatible with the volume of fluid the master cylinder can deliver. If the caliper piston requirement is excessive, the brake pedal will have an overly long stroke, which is very disconcerting for the driver. At the extreme, if it exceeds what the master cylinder can deliver, the piston in the master cylinder will reach the end of its stroke and bottom out, preventing full application of the brakes. 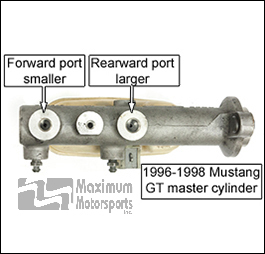 While you're confirming that your Mustang's calipers are a match to the Hydroboost master cylinder, it's also a good time to confirm your Mustang's front to rear brake bias is in the range of what works well. Fox and SN95 Mustang brakes should have between 70% and 75% front bias (also referred to as 70/30 and 75/25). The more heavily modified the suspension is for improved handling, the closer to 70% the front bias should be. An exception is a street and/or strip Mustang running an extreme 'big-and-little' combination of fat rear tires and skinny frontrunners, where substantially more rear bias is required to offset the lack of front tire grip. How do I confirm my brake calipers are a match to the Hydroboost master cylinder, and that my bias is good? You can calculate the fluid requirement of your calipers from the piston area, and then segue into calculating the bias by taking into account the rotor diameters. Or, you can take advantage of MM's Technical Services and let MM's setup engineer do the math. Select the Fox Hydroboost Conversion option, and follow the instructions. 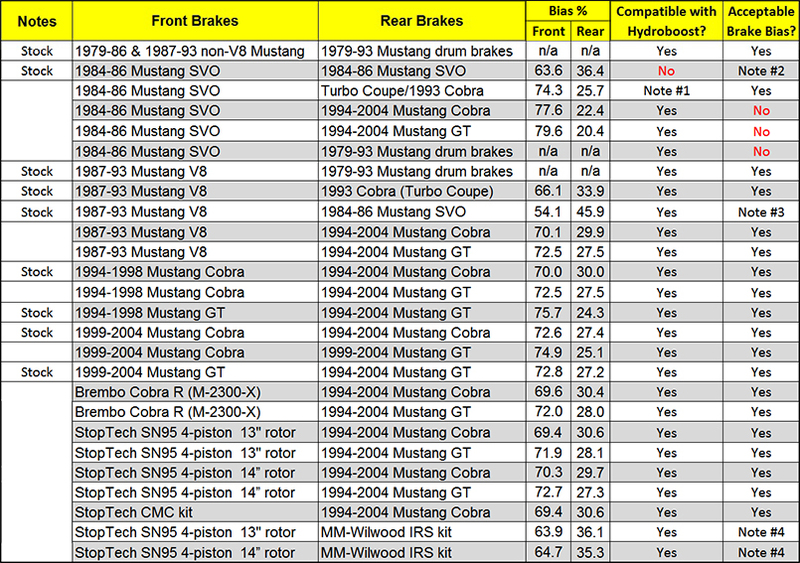 Most of the aftermarket big brake kits listed for SN95 Mustangs also work well on a Fox Mustang. There are some exceptions. Brake systems we've done the calculations for are listed on the Fitment tab. If you don't see your brakes listed, go to the Technical Services page, select the Fox Hydroboost Conversion option, and we'll run the numbers for you. The brake setups most likely to have poor bias are those put together by DIYers. These systems are often done following dubious Internet directions, or simply because the parts were readily available and easily bolted up. Good DIY mechanical skills don't always coincide with good brake system engineering. What's required, but not included? Brake hard lines connecting the master cylinder to the car's brake system. Which of the two Hydroboost units should I use? For best pedal feel use the 1999-2004 Hydroboost. 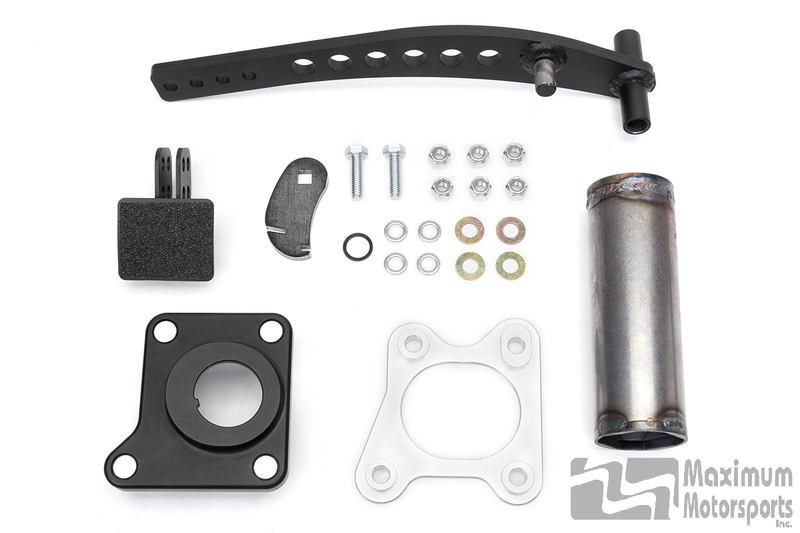 See the Parts ID tab for photos to help identify your Hydroboost unit and master cylinder. Ford's Mustang engineering team learned from their first Hydroboost experience. For the 1999 model year they significantly increased the pedal ratio to reduce the initial pedal effort required to activate the Hydroboost. Compared to the earlier unit, the later Hydroboost has lower initial pedal effort, helping to make precise brake modulation easier. 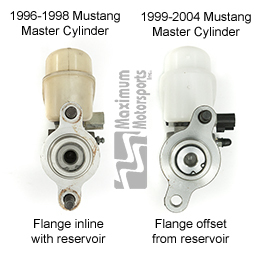 Two different Hydroboost units were OEM equipment on Mustangs. 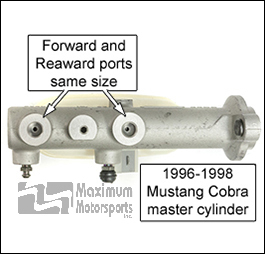 One unit was fitted to 1996-1998 Mustangs and the other to 1999-2004 Mustangs. Each of the Hydroboost units has its own set of unique hydraulic hoses. Mustang front brake calipers changed in 1999. The GT front calipers went from single-piston to dual-piston. The Cobra front dual-piston calipers had the piston diameter increased. 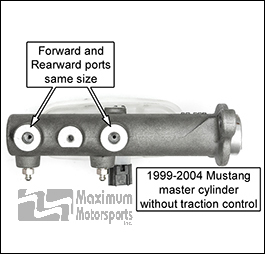 There are two different master cylinders for 1999-2004: One for Mustangs with Traction Control, and another for those without TC. They look identical externally, except the outlet ports are different diameters. The bore diameter is the same for both. The MM Firewall Adapter Block and MM Pedal Arm only work when used together. You will get bad results otherwise; see the DIY Fails tab. If you have the choice, use the 1999-2004 Hydroboost. Use the power steering pump from a 1996-2004 V8 Mustang. When swapping engines your life will be easier if you mount the power steering pump on the driver side of the engine, as the hoses will be shorter and easier to route. Install a fluid cooler in the return line from the steering rack, between the rack and the T-fitting for the Hydroboost return line. Recommended for all applications, and a requirement for track-driven Mustangs to prevent failure of the Hydroboost unit from overheated fluid. Match the hydraulic hoses to the year of the Hydroboost unit. 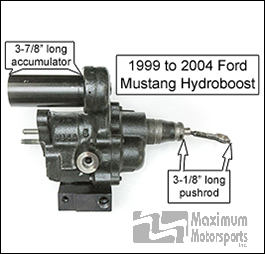 Allows installation of a Hydroboost unit so you can have power-assisted brakes on a Fox Mustang with an engine swap that leaves no room for a vacuum booster. No need to settle for manual brakes! Provides excellent brake response and consistent pedal feel regardless of the engine vacuum. Low pedal effort, even with small-diameter brake rotors. Mounts the Hydroboost unit/master cylinder and the brake pedal arm in the correct relationship to function as it was originally designed. Provides the same pedal feel (effort and travel) as a stock 1996-1998 Mustang GT or Cobra, when 1994-1996 GT front and rear brakes or 1994-1996 Cobra front and rear brakes are used, and matched with the corresponding 1996-1998 Mustang master cylinder. No modifications needed to the Hydroboost unit, making future service and replacement easy. Firewall Adapter Block bolts to the firewall, with only minor firewall modifications needed. It's still easy to return the car to stock. We include a new billet aluminum pedal box spacer to ensure your Hydroboost installation project isn't stopped in its tracks while you try to repair the stock plastic spacer you didn't know was broken until your Mustang was taken apart. Pedal pad location can be adjusted to suit the driver. Includes the socket required to tighten the giant nut securing the Hydroboost to the MM Firewall Adapter Block. Includes a special tool to easily and quickly modify the upper edge of the hole in the firewall for pushrod clearance. MM's billet aluminum Firewall Adapter Block mounts the Hydroboost unit at the correct angle, height, fore/aft location, and lateral location. 4 mounting studs on the Firewall Adapter Block match the Fox firewall hole pattern. 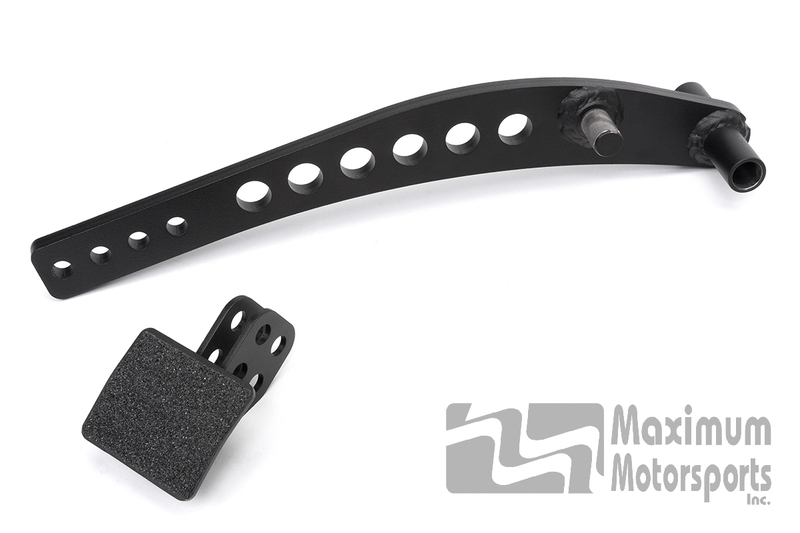 MM Brake Pedal Arm is made of high-strength alloy steel, with the pushrod pin in the correct location to match the brake pedal ratio and pushrod geometry of a 1999-2004 Hydroboost Mustang. MM Brake Pedal Pad is adjustable to suit different driver preferences. Billet aluminum MM Pedal Box Spacer replaces the breakage-prone stock plastic spacer. Includes MM Socket to tighten the giant nut securing the Hydroboost unit. MM special tool to modify the firewall. Retains stock brake light switch. 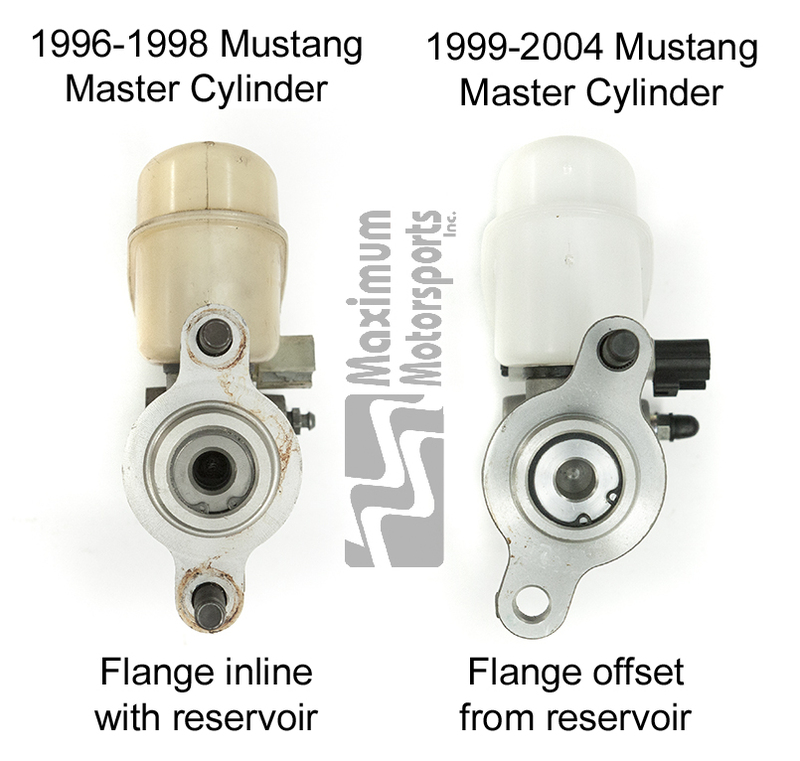 The Mustang Hydroboost units and master cylinders can be difficult to tell apart. The photos below illustrate the differences between them. You need to know which Hydroboost unit and which master cylinder you have in order to get the correct conversion kit and brake line kit. For compatible brake systems, see the list below. MM's Engineering Team has done the math to determine the compatibility of a Hydroboost conversion with many brake systems typically used on Fox Mustangs; see the table below. As a bonus, this table also includes the front/rear brake bias for those systems. 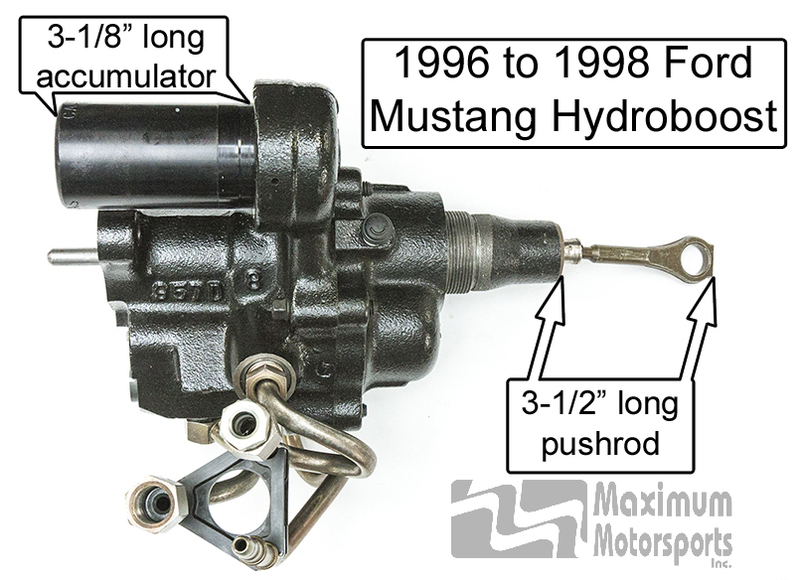 If your Mustang's brake system isn't listed, we can calculate its suitability for a Hydroboost conversion, along with the bias ratio; go to the Technical Services page, select the Fox Hydroboost Conversion option, and follow the instructions. Ford used brake proportioning valves with the slope and breakpoint pressures optimized for the various Mustang brake systems. This leads to some OEM Mustang exceptions to the general rule that front bias should be somewhere between 70% and 75%. The optimized OEM proportioning valve took care of the baseline bias being out of the preferred range. Aftermarket adjustable proportioning valves have more limited slope options, so it is quite important that the baseline bias be good. MM recommends installing an adjustable brake proportioning valve to fine tune the brake bias whenever any part of the brake system is changed from the stock configuration. Keep in mind that an adjustable valve is only for fine tuning; it cannot make up for a system that is grossly out of front to rear balance. Do NOT use with the early Hydroboost and master cylinder. May be used with the later Hydroboost and master cylinder. For a V8 equipped car, bias only works for a very light front end or a very heavy rear end. Bias only works for a track car with a very light front end, IRS, and road race stiff suspension. A quick Internet search will reveal many DIY Hydroboost installations. Also to be found are many failed DIY installs. The MM Hydroboost Swap Kit is designed to solve the problems that cause DIY installations to fail. The pattern of the 4 studs holding an SN95 brake booster (Hydroboost or vacuum) to the firewall and pedal box is different than the Fox Mustang pattern. Enlarge the holes in the firewall and pedal box to match the car to the Hydroboost stud pattern. Enlarging the holes is very imprecise, and the Hydroboost will never end up in the correct lateral location to maintain proper pushrod geometry. The result is binding and failure of the Hydroboost unit. 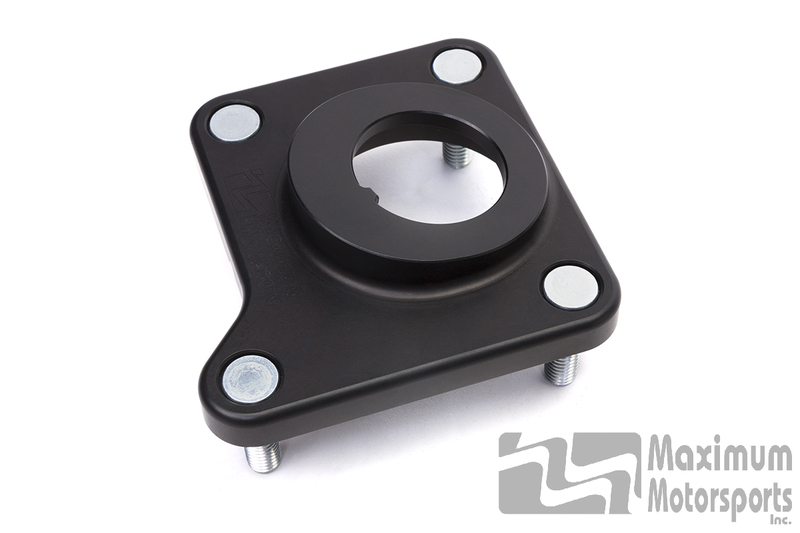 MM's aluminum Firewall Adapter Block has the correct stud pattern to mount directly to a Fox Mustang with no firewall or pedal box modifications. The firewall block positions the Hydroboost for correct alignment of the pushrod with the MM Brake Pedal Arm. The DIY installation of a Ford Hydroboost seems daunting. The fabrication required to create one's own "kit" is beyond the skill set of many DIYers. A Web search for a bolt-in kit finds one advertised as bolt-in, no modifications required to the firewall, and no need to change the Fox pedal arm. Best of all, the ad claims "great brakes" because the kit will "create up to 2,500 PSI of brake fluid pressure." A whole new set of problems. There were clues in that ad. No mention of pedal ratio. Stating there is no modification to the Fox pedal arm or to the location of the Hydroboost on the firewall means the kit does not have the pedal ratio optimized for the Hydroboost. The result is poor pedal feel, with high initial effort required to activate the Hydroboost. Your Mustang does not need 2,500 PSI of brake fluid pressure. The front tires of a Mustang typically lock up at less than 1,000 PSI. When the system creates nearly three times as much pressure as the brake system can use, the result is extremely sensitive brakes. It takes very little pedal travel to cause heavy braking, making it hard to modulate the brakes. Both generations of Mustang Hydroboost each have their own pedal ratio. Each requires mounting the Hydroboost unit in exactly the right location to match with a precisely located pin on the brake pedal arm. The SN95 firewall plate does not directly bolt to a Fox Mustang firewall. The pin on the Fox Mustang brake pedal arm is not in the correct location for a Hydroboost pedal ratio. Both items must be located in the correct relationship for the Hydroboost to function properly and not fail prematurely. For mounting the Hydroboost to the firewall, they modify the firewall and pedal box to match the Hydroboost stud pattern, or they modify the SN95 mounting plate to match the Fox firewall hole pattern. For the pedal pin, they modify a stock Fox arm with a new pin or install an SN95 pedal arm. To cope with incorrect alignment of the Hydroboost to the pedal pin, they modify the pushrod. They try to eyeball the location of all the components. Structural failure of the modified pedal. Structural failure of the modified Hydroboost pushrod. Incorrect pedal ratio, causing the pedal effort to be too high or too low. Incorrect static alignment of the pushrod, causing binding, which leads to poor brake operation and Hydroboost failure. Incorrect stroke of the pushrod. Overstroking can damage the Hydroboost and master cylinder. Understroking causes low pedal effort and lots of pedal travel. Incorrect dynamic alignment of the pushrod. As the pedal pin moves through its arc, the pushrod angularity changes. Improper angularity affects pushrod alignment, affecting pedal ratio and Hydroboost longevity. Incorrect lateral alignment of the Hydroboost unit to the pedal arm. The lateral offset of the Fox vacuum-assisted pedal arm and the SN95 Hydroboost pedal arm are different. Failure of the seals in the Hydroboost unit because of damage from the heat caused by welding a modified pushrod back together. 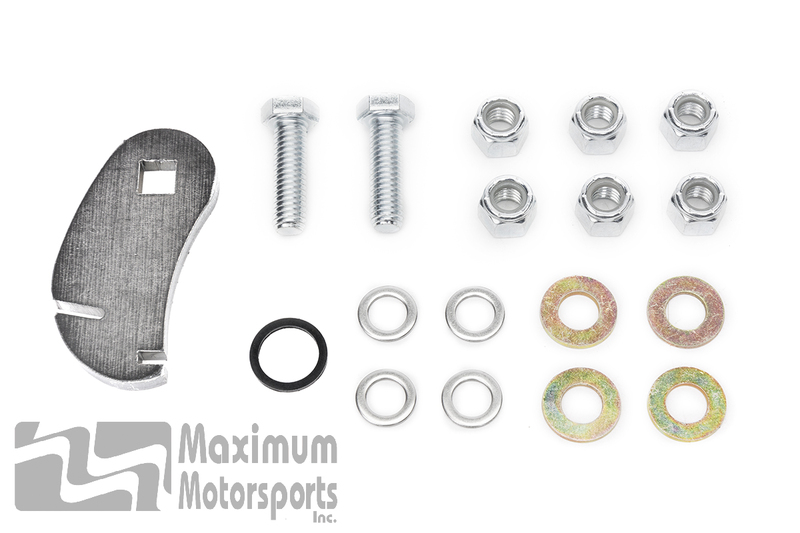 MM designed every component in this kit to accurately locate the Hydroboost and brake pedal to maintain correct pushrod alignment and provide the correct pedal ratio. This required the whole system be designed with extreme precision. To that end, the MM Engineering Team created an accurate 3D CAD model of the Hydroboost unit, firewall, pedal box spacer, pedal box, pedal arm, and pedal pad. We designed components in the computer model to maintain proper pedal pad height, provide the correct Hydroboost pedal ratio, and correctly align all components to each other while also fitting the Fox chassis. 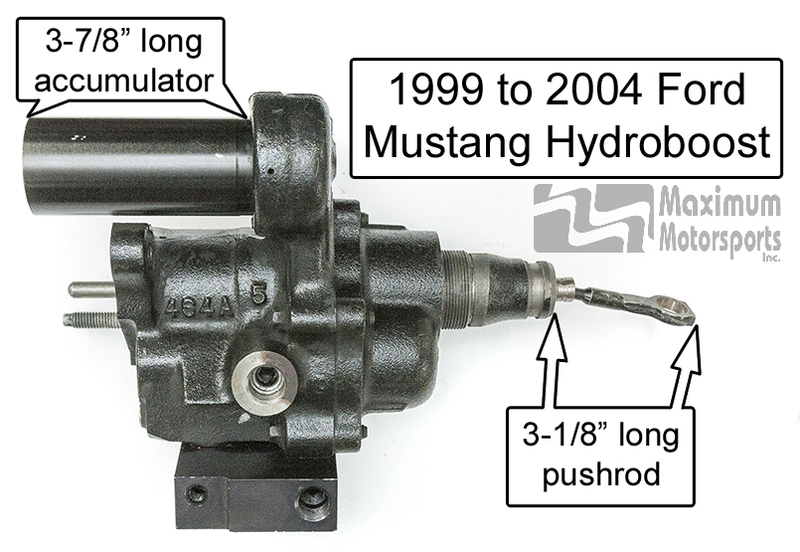 This design process also resulted in the early and late Mustang Hydroboost swap kits having different firewall adapter blocks, pedal arms, and tools. How do I know which Hydroboost unit and master cylinder I have? See the Parts ID tab. It has photos pointing out the differences between the Hydroboost units, and the different master cylinders. That will help you identify your Hydroboost unit and master cylinder. What power steering pump should I get? That depends on what project you're doing. 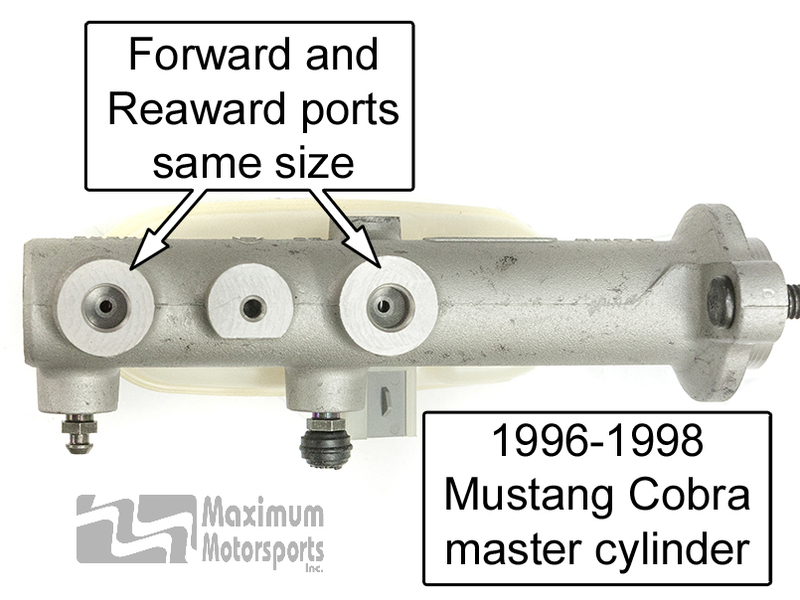 Coyote swap kits typically use the 1996-2004 Mustang modular V8 power steering pump; an excellent choice. If you are installing Hydroboost on a Mustang that has a pushrod engine (5.0L, 351, etc. 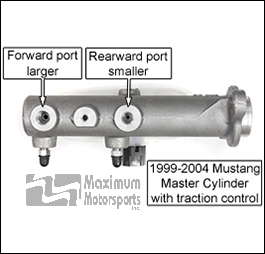 ), the OEM Mustang power steering pump is suitable. If you are using an aftermarket race pump the flow rate needs to be adjusted to match the Ford pump flow rate. Exceeding the Ford spec for flow rate will cause over-assisted steering and over-boosted brakes. 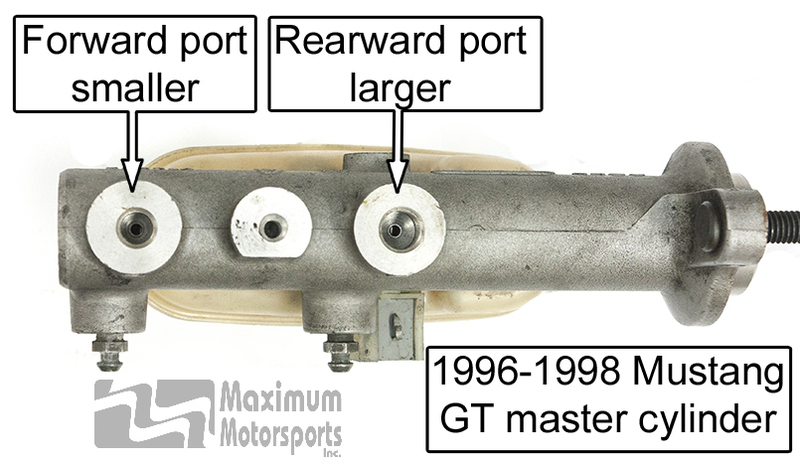 Many of the aftermarket race power steering pumps are based on a GM design; GM pumps have far too much flow for the Ford power steering and Hydroboost. I have an aftermarket big brake kit. Will the Hydroboost still work? Probably. The Hydroboost is just a different type of power assist. You do need to confirm that the Hydroboost master cylinder will supply enough brake fluid to properly operate your brake calipers. Some calipers may have too much piston area for the amount of fluid the Hydroboost master cylinder can supply. Look at the list on the Fitment tab for brake systems we have checked. Related to proper operation is proper front to rear brake bias. That's also listed on the Fitment tab. If your brakes aren't listed, go to the Technical Services page, select the Fox Hydroboost Conversion option, and follow the instructions. I'd like to use braided stainless steel hoses for the hydraulics. How do I do that? We do not recommend using braided stainless steel hoses in the power steering system for street applications. These hoses do not have the necessary hydraulic compliance required in a power steering system and as a result may cause the steering system to oscillate in some situations, such as when parking. Braided stainless steel hose transmits much more steering pump noise than does standard power steering hose. If you insist: use the MM-designed adapter fittings (ST-73) to connect -6 AN hose fittings to the steering rack. That's all we have available at this time; we're working on making the other adapter fittings available. Why doesn't the MMBAK-20 fit the 1996-1998 Hydroboost? 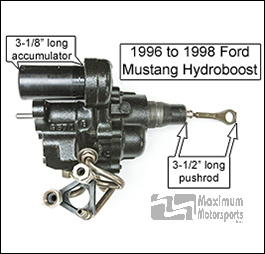 The earlier Mustang Hydroboost has a different pedal ratio, which requires a different location for the Hydroboost unit and a different brake pedal arm to match. Vehicle brakes are designed as a system. The design goals are to provide short stopping distance, resistance to rear lockup, and good pedal feel (pedal travel and effort). Several critical technical factors interact in the design process, but there's room for variation while still achieving the goals. The trick is to vary them correctly to avoid a bad result. Critical factors include the mechanical pedal ratio, master cylinder bore diameter and stroke length, front and rear rotor diameters, front and rear caliper piston area, amount of power assist, and pad material friction. All must be chosen to work together in a manner that provides the desired pedal effort and travel, and front-to-rear brake bias, to provide short stopping distance and resistance to premature rear wheel lockup. Changing one or more parts of the system must be done carefully to avoid unintended consequences. That's why when converting to Hydroboost power assist you need to make sure the rest of the brake system is compatible with the specific Hydroboost you select. 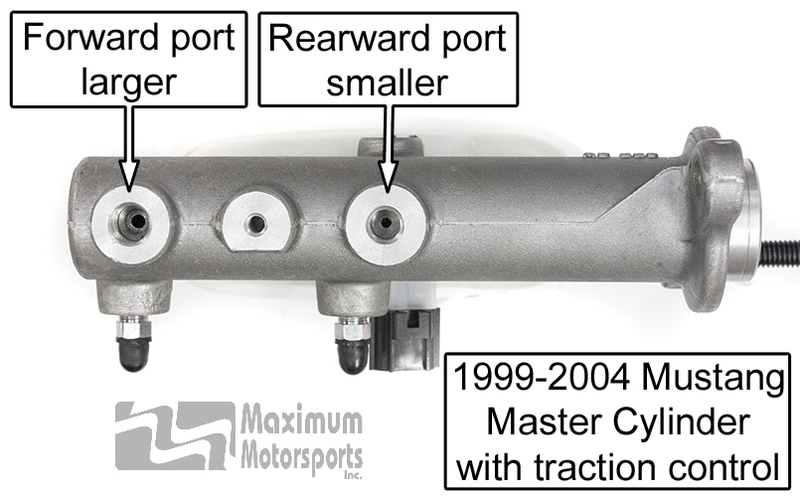 There is only 1 master cylinder size available for each generation of Hydroboost. There are far more options available for the other components in the brake system. You need to make sure that the rest of your brake system will work well with the particular Hydroboost unit you install. You can read Maximum Motorsports' highly detailed MMBAK-19 and MMBAK-20 Hydroboost Conversion Kit installation instructions before purchase.